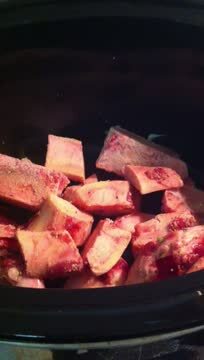 Beef & Chicken Bone Broth. Bone Broth is super healthy for kids and their overall health. I admit I am not a fan of drinking it on its own and my kids tried this and neither are they. So what we do is pop it into our meals so we get the benefits but without the overpowering taste. 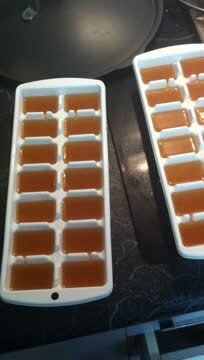 I keep some in recycled jars in the freezer and pull out when needed. 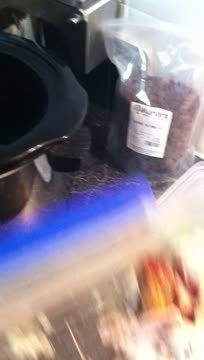 I will use Broth in place of water when cooking brown rice, also for some liquid while cooking my mince for a bolognese sauce and I even chuck a few ice-cubes into our stir-frys so the vegetables can soak up the nutritional goodness. Another popular way they are getting used is popping an ice-cube or two into your smoothie, you should not taste them with all the other ingredients. 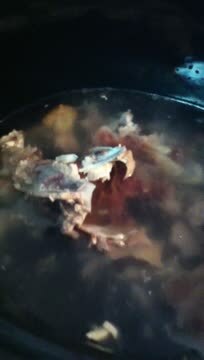 Beef Bone Broth and Chicken Bone Broth can be made quick and easy and then left in the slow cooker to do its thing and then you drain and use. I like to freeze into ice - cube sizes. You can add broth to nearly all foods and most of the time you will not taste it as you can use as little as a cube at a time. Assisting our bones to grow and repair due to the calcium, phosphorus and magnesium. Fighting infections and speeding up illness recovery. Specifically chicken bone broth contains a natural amino acid called cysteine which assists with respiratory illnesses. Supports hair growth, nail strength and skin regeneration due to the collagen and gelatin in the broth. Helping our overall gut health and assisting the digestion of nutrients. Repair damaged joints and reduce pain and inflammation due to the glucosamine in the bone broth. Glycine is an amino acid and neurotransmitter and can improve sleep quality. Make sure you watch the videos above to see how easy this is to make. It will save you money and really take care of your children's health.